At our parent company The Iona Group, we are continually developing eLearning for a great roster of exceptional clients. Right now we are in the midst of building a course on safety situational awareness, or safety SA as we like to call it. Situational awareness is the practice of taking a 360-degree view of your environment and making informed decisions about possible hazards or issues that might have a direct influence on your job, health or safety. SA is not only taught to corporate workers and service people as a best practice but is also used effectively by police and fire specialists. It’s important to have a comprehensive view of your surroundings and the context in which you are achieving your task and accurate situational awareness can lead to successful outcomes. As you try to implement different mobile learning into your enterprise, use situational awareness to build successful and effective training. Mobile learning presents a whole new set of challenges and having an accurate awareness of variables such as your audience, the devices they use and their environment is critically important. Let’s look at some of these challenges and see how strong situational awareness can help you meet them. Understanding your target audience is very important to successful mLearning. How well do you know them? What is the demographic of your typical learner? Bringing mobile learning into their daily work environment might be a drastic change to their lifestyle. It’s critical to understand your audience and measure how they are going to react to mobile learning. It might surprise you to find that they are ready to try it and even embrace it. Because they are probably using mobile apps, social media, and gaming in their personal lives, learning on their mobile devices may not be such a sea change. That doesn’t mean you have to create the next Angry Birds, YouTube or FarmVille for your organization, but it means you may well meet a receptive audience to an mLearning effort that uses gaming or video collaboration. Go out in the field and meet with your audience. See how they are already using mobile – if they even are. Ask them their likes and dislikes. What’s their favorite app and why? What do they think of receiving training on a mobile device? You can also ask them what their “pain points” are for training and determine if mobile learning can answer those issues. So, your first step in mLearning situational awareness is to know of your target audience. As long as you are out in the field with your audience, look at the world around them to add to your mLearning situational awareness. This is the environment you will be sending your mobile learning. Your learning environment for eLearning was very controlled when your audience was always sitting at a desk in an office and receiving the training on a large screen. With mLearning, you need to acutely know of your learner’s surroundings. Will it be on the plant floor? Maybe a coffee shop or a fast-food restaurant? In the front seat of their car as they wait to call on their next customer? Will it be noisy? Will there be bright sunlight? Indoors or outdoors? All of these physical environmental factors need to be considered in your mobile learning experience. For instance, what if you include audio and your audience can’t hear it because of the ambient noise around them? You don’t want to find that out on the day you launch your mobile app. You also need to think about what other people will be around your audience when they will receive your mLearning. It concerns some organizations about the perception of customers seeing their employees using mobile devices. A client or customer might think your employee is sending a text message or visiting Facebook on the job. Or the customer might think they can’t approach your employee because they are looking at a device. Customer perception can be a major factor in your mobile learning and you must be aware if it can influence the learning process or customer relations. Another area of mobile learning situational awareness has to do with the devices your audience will use. When you implement mLearning, you will need to assess what is the most appropriate device for your audience and their environment. Will the devices be company-owned or distributed? Or will the employee use their own device? You will need to work with your IT department to determine what operating system will work best with your current technical architecture. Many organizations are struggling in this area as they have been using BlackBerry devices for email and messaging, but the standout training mobile devices are Apple and Android solutions. There is another new component in mobile learning you have never had to consider in the past – or maybe I should say components, plural. Mobile devices have exciting features that can enhance your mLearning in ways that have never been possible. And chances are you and your audience already have experience using them so they won’t be so revolutionary. For instance, there is geolocation. Perhaps your learning objectives can be strengthened by the device knowing exactly where your learner is located. How about the gyroscope or accelerometer? It’s possible you could create gaming or simulation that takes advantage of the user tilting or shaking the device to affect the gameplay or interaction. Maybe you could take your mobile learning to new levels by encouraging or even requiring collaboration between learners by linking into prevalent social media solutions like Yammer, Twitter or Facebook. Mobile learners are very effective at teaching each other, according to our observations. Not all of the training knowledge needs to come from the mothership. Spend focused attention on the devices you will deploy for your mLearning and how you can make the most out of their myriad of capabilities. Even great ideas will fall flat if they aren’t delivered by appropriate mobile devices. Much has been written about Steve Jobs and his recent passing, and there is not much I can add to the tributes and the near reverence his devoted followers have already written. But I would like to make the point that part of his success had to do with his acute situational awareness. With hindsight, we can see how Jobs had a tremendous understanding of his potential audience and what they needed or wanted. He also took into account the environments that customers would use iPods, iPhones and iPads and guided his company to build devices that worked well in those environments. And finally, he had an awareness of what those devices could achieve and he took advantage of many new technologies to bring the customer more value and enable them with more mobile power. Steve Jobs is a model example of someone who took in the 360-degree view of his challenges and opportunities and showed exemplary situational awareness. As you asses your current mobile learning environment, what can you discern from using situational awareness? Do you have a strong understanding of your audience and in the environment in which they will learn? And how about the devices they will use? 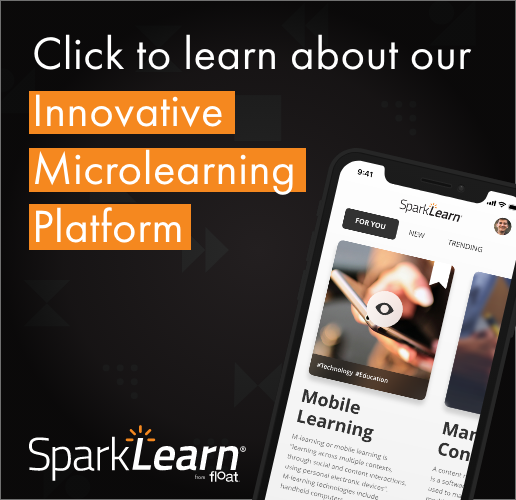 There is a lot to learn and know as you implement mLearning within your organization and you can determine and reach your goals more by using your mobile learning situational awareness. What are insights or conclusions you have arrived at in your assessment of your mobile learning landscape? Do you have a good SA story to relate? Write them in the comments below and share them with the rest of us. Remember, there is great power in collaboration! Scott McCormick is a founding partner of Float. Building on more than 30 years of experience in training, eLearning, and mLearning efforts for Fortune 500 companies, Scott helps companies embrace new learning strategies and deliver results. Scott is in charge of client relationships with global leaders in healthcare, manufacturing, hospitality, and insurance, and is instrumental in building new business and contributing to Float’s thought leadership efforts. Scott is featured in Float’s latest book, “Mastering Mobile Learning,” available from Wiley and ASTD Press.